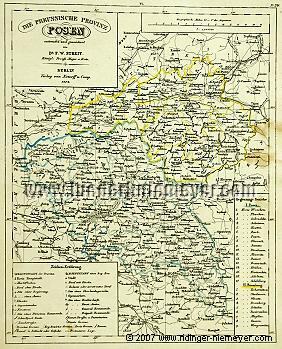 (Posen, The Prussian Province.) With cartouches for title, administrative districts, signs and symbols + miles indicator. Detail map by Frdr. Wilhelm Streit (Ronneburg, Thuringia, 1772 – Berlin 1839) in steel engraving colored in outline. Berlin, Natorff u. Comp., 1834. 10⅝ × 8⅝ in (27.1 × 21.8 cm). With Posen as centre up to Breslau – Glogau – Naumburg – Landsberg – Arenswalde – Schneidemühl – Hammerstein – Neuenburg – Graudenz – Konin . – With road net + express post-routes with post stations , secondary schools , courts of appeal , forester’s houses + forest authorities , channels , dams , Masonic lodges etc.